This week’s bag contents are pretty eclectic. In fact, I don’t know where she found some of this stuff seeing as I haven’t see it in a very long time. In the last WIBB post, I received a very strange comment on the post regarding the contents of Baylie’s bag. It all but accused me of being a child pornographer because apparently the doll’s bathing suit in the picture looked like a child’s bra (random?). I promptly deleted the comment and was very close to letting the reader know to take their business elsewhere. So, for any new readers of The Goon Room, What’s in Baylie’s Bag? 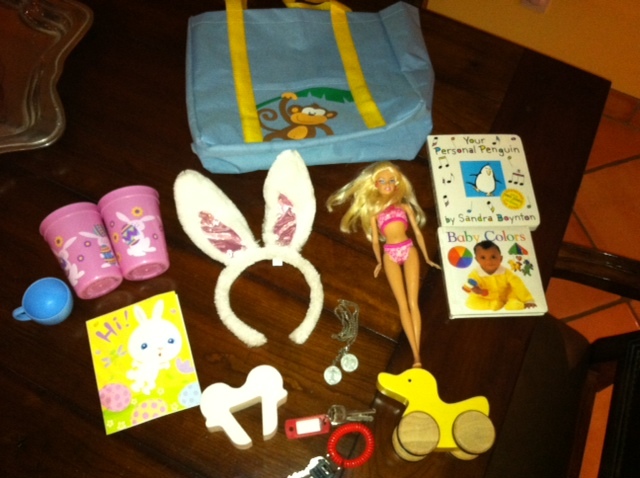 is a weekly post that details the contents of my sweet two-year-old’s bag of choice. It’s amusing to see what she has decided is worthy of carrying around repeating “let’s go!!”. This week’s bag: New Monkey themed bag from the $1 section at Target. Baylie makes “monkey” sounds when she points to the picture. Haha! Love that she has a door bumper… for all those instances when a girl just needs a door bumper! What a sweet idea. Thanks for the insight into what goes on inside a little 2 year olds mind. I think it’s cute to see what they value at any age, but moreso when they are so young and the mind so fresh. Pure impulse.